Rescuers reached the site in eastern Indonesia where a passenger plane slammed into a mountain over the weekend, killing all 54 people on board, and found that the aircraft had been destroyed, (Pictured) officials said. More than 70 rescuers reached the crash site, said Henry Bambang Soelistyo, the National Search and Rescue Agency chief. The flight data recorder and the cockpit voice recorder _ the plane's “black boxes'' _ were found in good condition, Soelistyo said. The data they contain could help explain what caused the Trigana Air Service plane to crash Sunday. “The plane was totally destroyed and all the bodies were burned and difficult to identify,'' Soelistyo told The Associated Press. He said all 54 bodies had been recovered and would be taken to Jayapura, the capital of Papua province, so they can be identified. The ATR42-300 twin turboprop plane was flying from Jayapura to the city of Oksibil with 49 passengers and five crew members on a scheduled 42-minute flight when it lost contact with air traffic control. 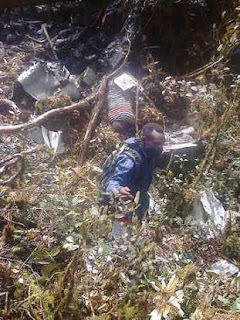 Soelistyo said the wreckage was at an altitude of 2,600 meters.